Earth’s oceans cover 71% of the surface of the planet. Even a casual inspection will tell you there is more to seawater than just water. You would expect the two most common elements to be water itself, hydrogen and oxygen. What else is found in Earth’s oceans? These tables answer this question. 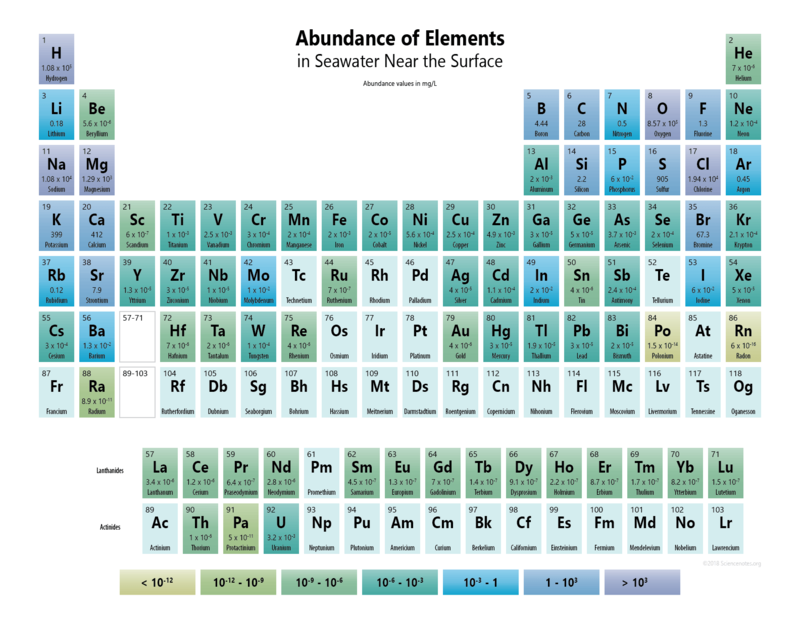 This printable periodic table contains the abundance of elements in Earth’s oceans. Each element is represented by its atomic number, symbol, name, and abundance in milligrams per liter of seawater. A PDF of this table is available for easy printing. The colors represent a break in the ranges over three orders of magnitude. Elements with no measured values or no data are left blank. The abundances recorded are a median of measurements taken from around the world. Elements with trace amounts can vary across measurements by several orders of magnitude. This table contains the same data arranged in a simple format and arranged by abundance. ← What Is Belly Button Lint?